In the years of the Stross Family rulership of Zobeck it is said that the forest was ruled by the Shadow Fey and that they gave permission for the Stross nobles (and ONLY nobles) to use the forest as a private hunting ground, but this is not really true, for although powerful Shadow Fey may once have existed within the forest, The Old Margreve has never really been “ruled” and in fact, appears to have a life of its own. In elder days, the Old North Road cut through the forest on the trade route to the rich northern cities that are now part of Morgau and Doresh, and indeed both the road and the trade still continue, although somewhat diminished. Where the road was once guarded by the eight Griffon Towers under Zobeck’s Order of Griffon Riders, this is no longer the case and the towers have fallen into disuse. However, there are still inns along the road at three day intervals where traders and travellers can rest their weary feet or beasts of burden. The Old Northern Road is the only route that crosses the forest from one side to the other. It is also the only route or path within the forest that does not seem to change, all other paths being subject to the power of the forest itself. The road runs from Zobeck to Castle Valach, on its way to Bratislor in the north and usually takes about two weeks on foot or eight to ten days for a wagon or train. The most civilised resting spot along the way is the Eyes of the Forest Inn, defended by experienced military men and managed by Zobeck natives. It is the midpoint on the road, but there are other lesser inns as well. Much of the traffic consists of Kariv caravans and it has often been remarked that those seen on the road do not nearly match the numbers that seem to arrive in Zobeck, prompting a rumour that some of the Kariv may have a deal with the Shadow Fey to use Shadow Roads for part of the way. Feral Griffons, descendants of the elder Griffon Order, roam the area and will sometimes attack caravans from above. It is known that the ruins of Shadowcrag Castle lie several days to the west of the Eyes of the Forest Inn, and it is believed that other old places may exist within the forest. 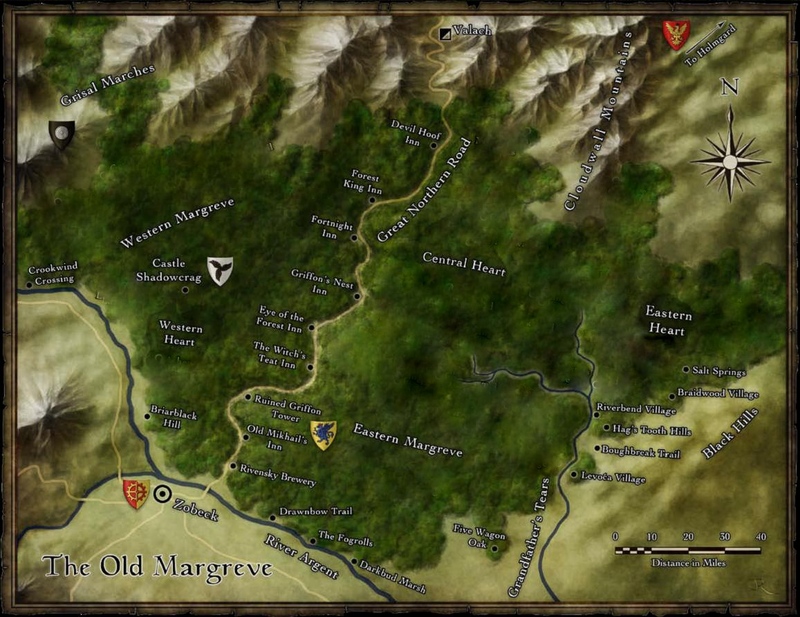 This is an area about one third of the forest to the west of the Old Northern Road that is mainly flat, apart from the mound of the ruined Castle Shadowcrag and the hilly area where the forest meets the Dwarven Cantons. This area is about one third of the forest and consists of the area encompassing the Old Northern Road. The trees are predominantly deciduous in the south and coniferous in the north. This area covers one third of the total forest area, to the far east of the Old Northern Road. It is a monotonous collection of indistinguishable trees with a handful of small lakes and is notoriously difficult to track but easy to get lost in. All survival checks are at -5. The Margreve is about three quarters location and one quarter magical beast. Its personality, will and mindset are ancient, bordering on alien. It nourishes itself. It defends itself. And it remembers those who have challenged it in the past. It is in many ways like any other creature, with the notable exception that it is the size of a country. SENSES: It enjoys a forest-wide tremorsense and recognises those who travel through it by blood spilled. The first time an individual bleeds upon the forest floor, the Margreve knows him or her and catalogues their acts under the signature of blood until they leave the forest. When an individual re-enters and bleeds again, the forest “remembers” the blood and connects current activity to the catalogues of the past. The blood of ancestors is also remembered, such that those whose ancestors once performed dark deeds in the forest will feel a great threatening presence all around them. MEMORY: What the Margreve consumes, it remembers. In addition to recognizing and remembering creatures by the blood they spill, the Margreve absorbs many of the memories and much of the knowledge of those who expire beneath its canopy. Anyone who lays down, even for a moment, is in danger of the being held and consumed by the roots of the forest and people who have lain for more than a day, will need to be physically cut out and chopped from the very trees in order to be removed. ATTITUDE: The forest dreams of ancient times, of the behaviours of long-dead creatures and pre-civilized forest dwellers, and as a consequence, the Margreve considers correct those behaviours of old, and believes incorrect behaviours must be pruned like limb and blossom. Interlopers who exhibit incorrect behaviour take their lives in their hands when they step into the woods, as the Margreve has an attitude toward each inhabitant dependant on the forest’s memories of their actions and their adherence to the Old Ways. Newcomers to the Margreve inherit the attitude of their closest blood relative. MOVEMENT: Like all intelligent creatures, the forest has leraned that the element of surprise provides great tactical advantage, and using its tremorsense it can tell when target creatures are still and their heartbeat slow. The Margreve may move paths, add forks or redirect game trails at will. During the day, the canopy can be moved to block the sun’s rays and create up to an acre of dim light to affect creatures who suffer under such conditions. Similarly, it often creates the opposite effect for Vampires travelling through its domain. Landmarks cannot be trusted. A compass is the explorer’s only friend. Aura of Rust: Iron and iron alloys rust quickly in the Margreve such that sharpening and replacement cost of rusted axes and saw mill blades makes large scale logging unprofitable. A dagger becomes broken in a day, destroyed in 2. A light metal-hafted weapon becomes broken in 5 days and destroyed in 10. Mending and Make Whole effectively repair rusted weapons. Aura of Wildness: All beasts and animals in the Margreve have a tendency toward reverting to a feral state. Lycanthropes and individuals with the Wild Shape class feature will struggle to assume humanoid form. Awaken and Control: The Margreve can awaken all flora and fauna within its domain to act on its behalf. The extent of this power is not known but bards sing of a great Margreve expansion when “the lands east of the Cloudwalls fell to an army of treants to rival the legion of angels”. Reincarnation: All fauna can be spontaneously reincarnated within the Margreve. Siphoning Magic: The Margreve siphons all magic cast within its borders. In an area where a Cure Light Wounds spell is cast, the grass around it becomes lush and vibrant. This is because the forest has siphoned off some of the power of the spell. The Margreve desires caster to cast more spells so that it can siphon more spell energy. Once a spell is cast, the Margreve recognizes that the caster “has food” and capitalizes on the opportunity to extract more spells to siphon. By manipulating trails and carrying sounds, the Margreve may route dangerous creatures toward spellcasters in the hopes that more siphonable magic arises as the caster defends, attacks and heals. Magical Nature: All sentient inhabitants of the Margreve have some magical ability. Even those who do not normally use magic will have at least one CANTRIP or ORISON that they can use at least once per day. 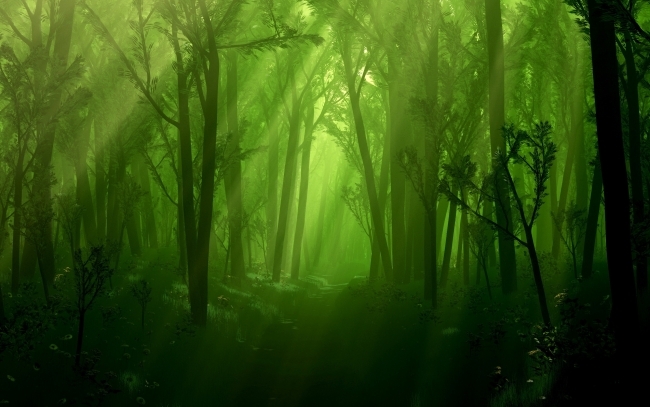 The power of the forest is concentrated in its hearts. There are currently two hearts – Western and Central – it is said that the Eastern Heart is yet to develop but that the timing of this event is imminent. In each HEART vast concentrations of magical power have been siphoned and stored for millennia so that the power held within each of these hearts exceeds that of major artifacts. Few interlopers are tolerated in these areas and they are fiercely guarded by powerful forest guardians. The WESTERN HEART harnesses the bulk of its power from the Shadow Plane. The HEART’s taproots pierce the plane of shadow and grip its tattered edges, suckling on its negative energy. Shadows in the west are disproportionately long, even at noon and plant life flourishes in dim light. The CENTRAL HEART is a place of unbridled wildness. Trails disappear behind trailblazers, poisons are more deadly, diseases more virulent and travellers devolve supernaturally to beasts. The forest uses Warp Wood and Animate Plants frequently and it is said that Baby Yaga often makes her home in this region. The EASTERN HEART is said to be “on the cusp”. Although the Margreve crested the Cloudwalls and spilled upon the Rothenian Plain centuries ago, a new Eastern Heart of the Forest has not yet formed, but rumours abound that this is not far off. Margrevians open the eyes of their dead, lest the deceased wander lost and angry through the wood, unable to find their way to the afterlife. Sinners confess their transgressions by cutting themselves and dripping their blood upon the thirsty forest floor. Evil men heal themselves before a single drop falls. A bloodless man cannot pass to the afterlife. Consequently, the dead are never buried, lest the roots exsanguinate them before the souls can reach heaven. One of the greatest punishments is to be buried—dead or alive. Revenants of the buried haunt the Margreve. Every dawn, they return to their graves, and the root wicker cage that was once their circulatory system. Any man-made structure built without sacrificing blood to the forest shakes itself down upon its owner. In a year’s time, treants grow from those dead who have commended themselves to the forest with sap, seed, and ritual. There are places in the forest that give or take youth, but only the unborn and the dead can find them. Margrevians extinguish torches before midnight. This is related to a far older tradition: Margrevians do not permit white moths to gather, lest a mora (witch) hide in their number. If you count butterflies one less than your group’s number, one of you will die. An evil creature is born every time a “civilized” man enters the woods. Margreve beasts must never leave the forest as tamed companions of outsiders, lest the beasts become infatuated with “civilization” and become half-men, abominations that outsiders call lycanthropes. If you nail the skin or hair of a sick person to a tree, the tree will absorb part of the disease and lend its strength to healing the illness. Ancestors store wisdom in the trees, but only descendents of their bloodline can tap it by clawing into the tree ring present in the ancestor’s day. Every year, Margrevian kin, friends, and lovers celebrate the upcoming spring by giving each other blood-dyed pieces of thread. Each wears it until a tree signifying their relationship blossoms, whereupon the bearer drapes the thread upon the blossoming branch. It is an ill omen if the tree never flowers. Terrible feuds have blossomed from trees that do not. Every plant has a theme, a power, and a purpose. Flowers tend to be the beguilers, and that is perhaps why outsiders are so fond of them. True power lies in leaf, stem, and root. Salt is incapable of holding magic, and makes an excellent ward against magical creatures, enchantments, and curses. Margrevians who hear rumors of salt-encrusted springs are like gold-diggers hearing of a new vein. Salt is one of the few reasons that Margrevians meet merchants along the Great Northern Road. I'm sorry, but we no longer support this web browser. Please upgrade your browser or install Chrome or Firefox to enjoy the full functionality of this site.